Fujitsu Limited and Fujitsu Laboratories Ltd. today announced the development of the world's first 300 GHz band compact receiver capable of high-speed wireless communications at a rate of several tens of gigabits per second. Radio signals with a frequency greater than 100GHz, called the terahertz band, allow for increases in usable frequency range and communication speed of more than 100 times compared with the 0.8-2.0 GHz range used by current mobile devices. 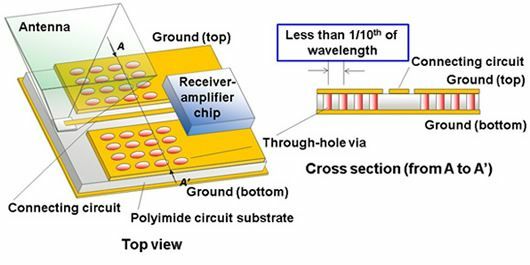 Now, Fujitsu has developed technology that combines a receiver-amplifier chip and terahertz-band antenna with a low-loss connection. This has made it possible to reduce the receiver's size to one tenth that of previous receivers, making use in mobile devices possible. Details of this technology will be presented at European Microwave Week (EuMW) 2015, the international conference to be held beginning Sunday, September 6, in Paris, France. High-volume data communications such as video and music downloads are widely used on mobile devices such as smartphones and tablets. With an anticipated shift to high-volume data communications, such as 4K and 8K HD video and high-resolution audio sources, there will be an increasing need for near-instantaneous downloads (Fig. 1). This makes a speed increase in wireless communication devices necessary. Such devices that use the terahertz band, or frequencies over 100 GHz, are able to increase both the range of useable frequencies and the speed of communications by over 100 times of those used in current mobile terminals. On the other hand, as terahertz-band waves attenuate sharply when propagating through space, a highly sensitive receiver is necessary to receive data from weak waves. 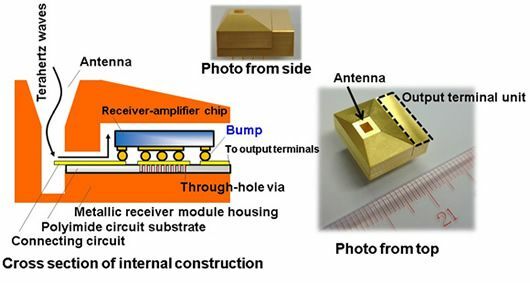 In recent years, highly sensitive receiver-amplifier chips that work in the terahertz band have been developed by a number of companies, but with the necessity to make the module that mounted the receiver-amplifier chip and the exterior antenna separately, the receivers produced were large and difficult to integrate into mobile devices. By developing a low-loss technology for connecting terahertz-band antennas with already developed receiver-amplifier chips, Fujitsu has now developed the world's first 300 GHz band receiver with an internal antenna. With a cubic capacity at 0.75 of a centimeter (not including output terminals) it can be installed in mobile devices.